The Bird’s Nest Spruce is one of the most common dwarf evergreen shrubs. It is a member of the Norway Spruce (Picea abies) family; its Latin name is ‘Nidiformis’. 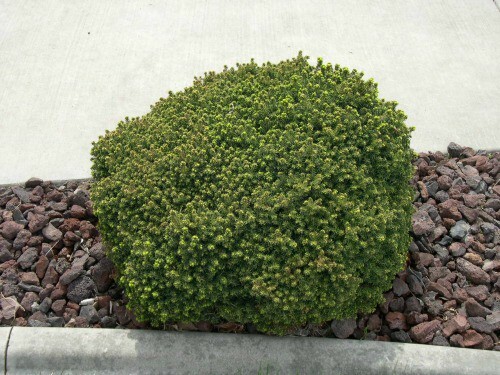 This attractive, low-growing shrub gets its name from a depression in the center that makes it look like a bird’s nest. A versatile shrub, it is perfect for mixed borders, group planting, rock gardens, and container gardening. It is well suited for transplanting because of its shallow root system. The Bird’s Nest Spruce is very low maintenance because it grows so slowly. At 10 years of age you can expect the shrub to be 1′ tall and 2′ wide. You can, however, prune new growth to give the shrub a desired shape, even to resemble a bonsai plant. 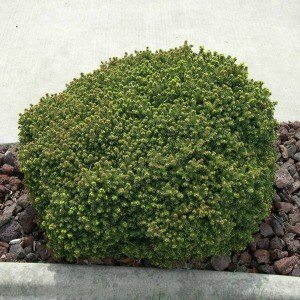 This hearty shrub is dark green in color, but in the spring new growth will appear light yellow-green. By late spring the branches are a uniform green. Grown in a variety of soil conditions, this shrub will thrive as long as there is adequate drainage. It prefers full sun with afternoon shade. You can apply low-nitrogen evergreen fertilizer in late fall or early spring for optimal growth, however, the shrub does not require regular fertilization. The most common pests that may bother this shrub are spider mites. Low populations of spider mites can be controlled simply by regularly spraying your shrub with the garden hose. Heavier infestations will require a pesticide. Best grown in zones three through eight, the Bird’s Nest Spruce will eventually achieve a height of 3′ and a width of 2-3′. Plants should be spaced 4-6′ apart. Water needs are minimal, this shrub can survive even in drought conditions. 2 Comments on "Growing Bird’s Nest Spruce"
How deep should I plant a bird’s nest spruce? Hi! I’m actually not sure, I couldn’t find anything that says how deep to plant them! I would think the roots just need to be covered really well, because one article I looked at said you can grow birds nest spruce in containers on your patio.